Gwen Blakley Kinsler, known affectionately as Crochet Queen, is a proud Lifetime Member of the Crochet Guild of America (CGOA) and founded the organization in 1993. When it comes to crochet, Gwen is a Crock Star (Crochet + Rock = Crock). Committed to the importance of sharing her passion for crochet with anyone, she is the co-author of two crochet books and is at work on her third on the art of crochet. Her work can be found at her Ravelry group, Cro-Kween Designs, where fans come to share wit and witticisms about their passion for crochet. This exciting method of crochet will set you “free” from worry and allow you to create for fun. Proudly wear your badge on I Love Yarn Day. The striking colors you choose and the creativity you put into is design will draw attention everywhere you go to your beloved craft! Notes: The badge in the photo started with an asymmetrical piece worked in Tunisian simple stitch. The flower is made with limpet stitches. Remember, there are no rules! Follow the instructions and/or make your own creative changes. These instructions are only guidelines to get you started. 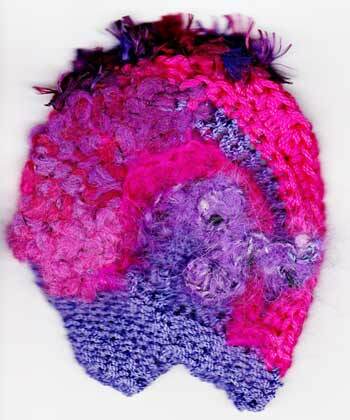 This is a great stash-buster project and the yarns used in the project photo are from my stash. The follow-ing yarns are also excellent choices: Bernat Softee, Bernat Baby Jacquard, Sensations Cello, Patons Silk Bamboo, Caron Spa. The plastic backing can be up-cycled from a milk bottle or other household waste. Back Loop Only (blo): insert hook in back thread of indicated stitch. Tunisian Simple Stitch (Tss): Crochet the number of chains needed for stitches required in the first row. Forward: working in back loop only (blo) of each chain, insert hook into 2nd ch from hook, yo, draw loop through and leave on hook. Insert hook into next ch, yo, draw loop through and leave on hook. Repeat this in each ch to end. Do not turn. Return: yo, draw through one loop (edge stitch), *yo, draw through two loops. Repeat from * until one loop remains on hook. Do not turn. The loop remaining on the hook be-comes the first stitch of the following row. TSS: Insert hook from R to L behind single vertical thread. Yo, draw loop through and leave on hook. Limpet Stitch: Worked on RS row-sc where limpet flower is desired; *loosely cast 5 stitches onto hook us-ing the “thumb cast-on” method; yo, pull loop through all loops on hook; ch 1; sl st in sc just made; rep from * 2 X to create flower. To Begin: Number each yarn/color as you choose. With color #1, create a square or rectangle in Tss. Rnd 1-Attach color #2 on top RS of Tunisian piece. Work an arch with sc, hdc, dc , hdc, sc in total number of stitches desired. Rnd 3-With color #1, work dcs in blo of stitches of previous rnd, increasing where necessary to keep piece flat; join color #4 at midpoint of rnd and work sc, hdc, dc creating another arch or shape desired; at end of rnd, work a 3-dc or 5-dc popcorn in last stitch of previous rnd. Rnd 4-With color #5, attach yarn to lower right side of beginning Tunisian piece and work a row of sc along side of Tunisian and continue around in top of stitches of rnd 3. Fasten off midway through rnd3. Rnd 5-Join color #5 on Tunisian piece beside the start of rnd 4 and working in blo, create an arch with sc, hdc, dc, hdc, sc stitches; continue around shaping as you go and work behind stitches of rnd 3. With the thinnest yarn in your group, ch 14, dc in 3rd ch from hook, 3 dc in same ch, 5 dc in each ch to end. Fasten off and attach to finished badge where desired. “curlie-que.” Cut strands at an angle to desired length (approx. 4"). Cut a pattern by tracing finished badge onto thin paper. Use pattern to cut a piece of ultra suede for backing. Sew pinback to fabric. Use pattern to cut a piece of plastic for reinforcement. Sew fabric to back of badge 2/3 around. Use pattern to cut a plastic piece, then trim it slightly smaller. Insert between badge and backing; finish sewing fabric around badge.